Sharing some of the hardest to find First Day Covers in Malaysia! 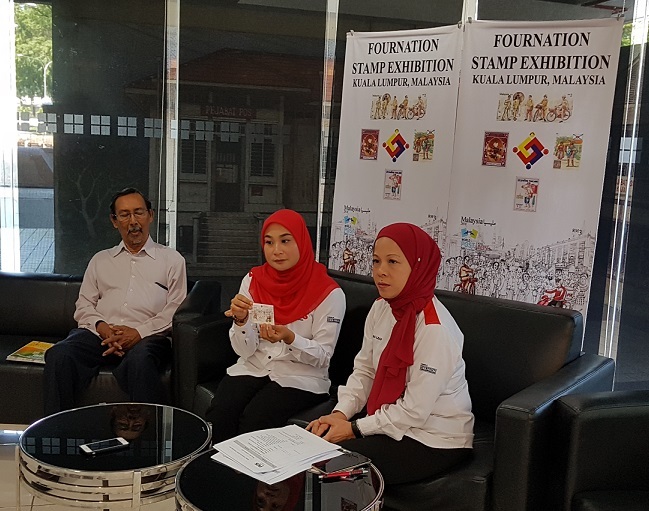 This morning (27 March 2019) was the media preview for the Fournation Stamp Exhibition. The event is organized by the Philatelic Society of Malaysia with the support of Pos Malaysia. Also invited in the media preview is Dato’ Anuar Bashah, the Chairman of the Organising Committee and also the President of the Philatelic Society of Malaysia. The Fournation Stamp Exhibition actually started off as Tri-Nation Stamp Exhibition by the national stamp societies. The first exhibition was held in Chiang Mai, Thailand in 2011. This was followed by Singapore in 2012. In 2013, the 3rd Tri-Nation Stamp Exhibition was hosted in the Kuala Lumpur General Post Office supported by Pos Malaysia. In 2014, it became Fournation with the inclusion of Indonesia. It was then held in Bandung, Indonesia. 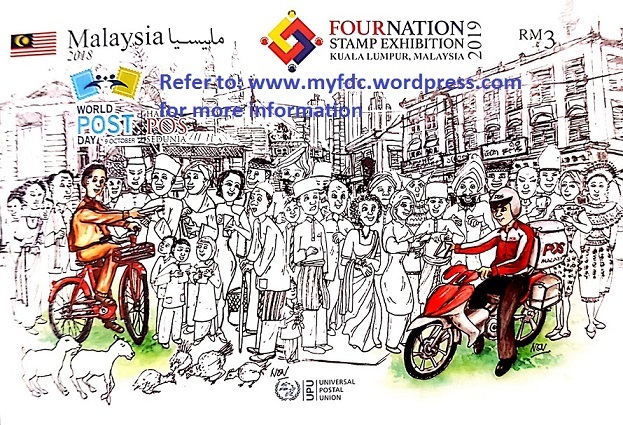 In 2015, Malaysia played host to the Fournation Stamp Exhibition in Melaka. This would be the third time that Malaysia plays host (if you count Tri-Nation). 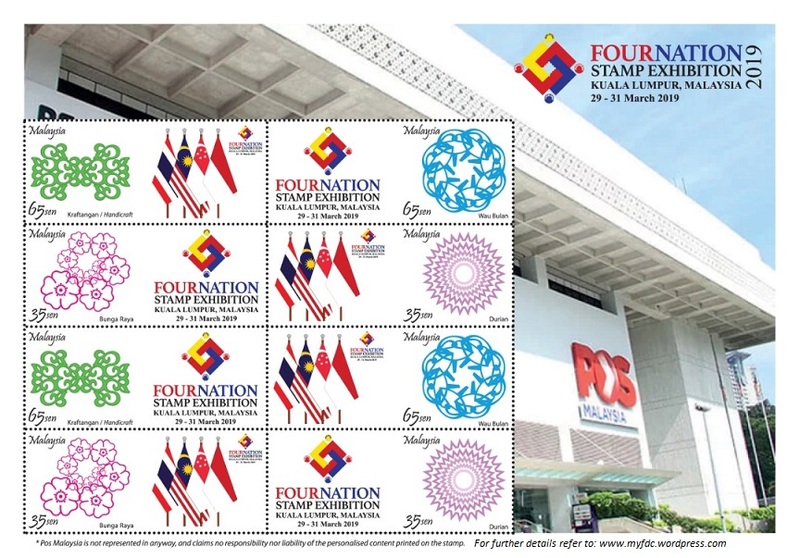 Pos Malaysia has issued a Fournation Overprint of the World Post Day 2018 Miniature Sheet for the event. A total of 5,000 pieces of the RM 3 Miniature Sheet will be made available. The MS will be on sale at the Philatelic Bureau in the morning at 08:30 am as usual. This will NOT be on sale in any other post office. Not to worry if you are not able to come to Kuala Lumpur, there are a number of MS reserved for Standing Order Deposit Account (SODA) members. If you do not have a SODA account, drop me a message. It will not be on a confirmed basis. I will see if I have time to attend. 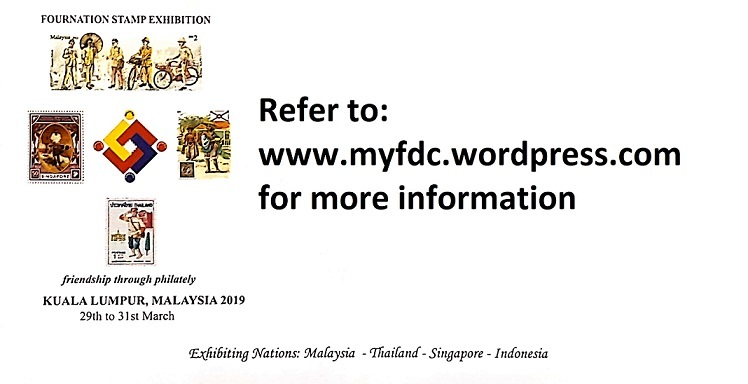 The Philatelic Society of Malaysia is also producing envelopes for the exhibition. The envelopes will be sold at RM 1.50 each. They are available from the PSM booth in the main foyer. If you met Dato’ Anuar, ask him about the umbrella and how it plays an important part for the postman in the early days (not just rain and shine!). Yes a cachet will be provided. There is NO daily cancellation. Thus far 2 local dealers, a dealer from Singapore and a dealer from India are participating in the sales area. Thus far, no national postal authorities have indicated their attendance. Timing? Opens 09:00 am to 05:00 pm except 31 March 2019 where the exhibition closes at 12:00 noon. In case you are all still clueless on the address, here it is again. LRT / MRT (they are linked) stop is Pasar Seni. If you are driving, the Central Market parking is much easier to walk over. Right, see you all there! Pos Malaysia will also issue a Personalised Stamp Sheetlet (Setem Ku) for the event. There is a special offer for the sheetlet at RM 18.00 each. The normal price is RM 20.00. Is the next issue on 30 March 2019 as seen in the SODA statements? Stay tuned for the next issue. I do not want to be left out! Select the payment by multiples of USD 1.00. A Warm Welcome to myfdc! Is there a stamp issue on 30 March 2019? 80 sen Orchids National Definitive complete blooms for 2018 series? One Step at a Time: 1000 Likes on myfdc Malaysia Facebook and 50 Followers! 09 January 2019: Palindrome or Not? We have a Winner 599,998! What is happening Next Year? Into the 7th Year and another (Malaysia Day Setenant) RM 1 Below Face Value Offer with Free Postage! Where is Mickey and Minnie? Updated 21 November 2018: M…I…C…K…E…Y ………. M…O…U…S…E ! Mickey is 90! SOLD OUT! Palindrome Date is back next Monday 8102018 or 81018!